"Method" was the theme for Le Challenge this month. When it comes to sewing apparel, there is definitely a specific "method" I adhere to. I am very much a beginner when it comes to making clothes and I am reluctant to deviate from the method I have found to enjoy and used. 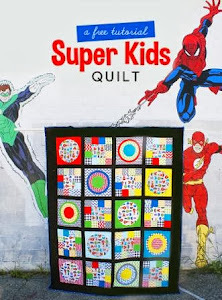 I almost exclusively use one pattern designer (Oliver and S), I stick to the instructions with exactness, I only use quilting cotton, and I only sew for my daughter. I prewash my materials and almost always have to make a quick shopping trip for notions. Quilting is a lot less "prescribed" for me. 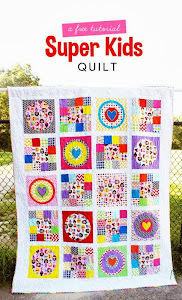 I never prewash, sometimes I follow a pattern (and I am willing to try all sorts of different designers), shopping is rarely necessary since I have such a "healthy" stash, and I have made quilts for many people in my life. I am willing to experiment, deviate from the instructions, and try new things. I am sure that with more experience and practice, my approach to garment sewing will become more adventurous. This fun print is a Clover Sunshine print designed by Alison Glass. I've got the kids calling it the "eye spy" dress because there are so many fun little designs in the fabric: an octopus, paintbrush, jet, rainbow, etc. The pattern I used is the Library dress by Oliver and S, in a 4T. Sometimes I spend inordinate amounts of time in the button aisle at the store but not this time! I am in love with the glitter-y buttons I found at Joanns. They match the dress perfectly. Even though this dress did not have cats on it, Charlotte loves it and I am so pleased. She wore it all day today and had to be bribed to take it off for a few minutes for me to get a garment-only picture. Success! Linking up with Le Challenge and Finish it up Friday. Adorable! I would not have been surprised if you told us she is sleeping in it! What a pretty print, it is beautiful worn! Thanks for sharing on le challenge. Such a cute dress, and worn by a darling little girl! She loves it, doesn't she! Lovely :) I AM VERY VERY LIKE.